Cairt wi the approximate location o pre-Roman Belgic Gaul shortly afore Roman conquest accordin tae an interpretation o Caesar. The Belgae war a lairge confederation  o tribes livin in northren Gaul, atween the Inglis Channel, the wast bank o the Rhine, an northren bank o the river Seine, frae at least the third century BC. Thay war discussed in depth bi Julius Caesar in his accoont o his wars in Gaul. Some fowks in Breetain war an aa called Belgae an O'Rahilly equatit them wi the Fir Bolg in Ireland. 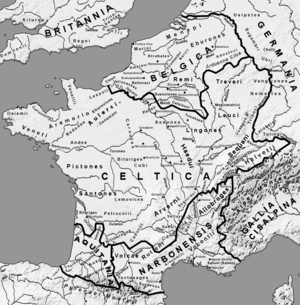 The Belgae gae thair name tae the Roman province o Gallia Belgica an, muckle later, tae the modren kintra o Belgium. ↑ Sage M, Michael. "The Republican Roman Army: A Sourcebook. p134". 11 January 2013. Routledge. Retrieved 17 January 2015. This page wis last eeditit on 31 August 2016, at 21:51.